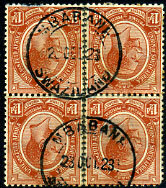 11 OCT 32 on CGH 2d (SG.50a) piece. 6 APR 09 on KE7 1d (SG.274), perf. fault. 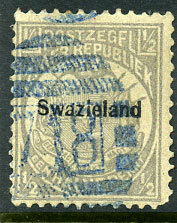 (D2) 15 AP 93 on Transvaal ovp'd 1/- (SG.3), thinned. on Transvaal ovp'd 6d (SG.6), corner perf. fault. (D/R) 29 APR 11 on KE7 1d (SG.274). interprovincial (early) use 28 APR 10 on Transvaal KE7 6d (SG.266), corner perf. fault. 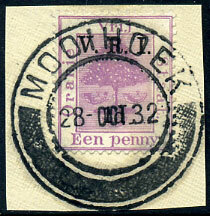 in blue ink on ½d grey (SG.4), perf. fault. ½d V.R.I. and 1d V.R.I. 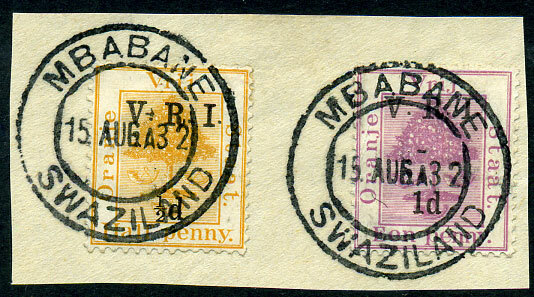 on piece dated 15 AUG 32. 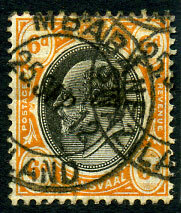 25 SEP 12 on Transvaal KE7 6d (SG.266).